My friend Joanne introduced me to this recipe. 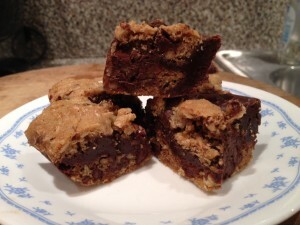 It is ½ a batch of chocolate chip cookie dough layered in the bottom of a 9x13 pan, topped with a simple fudge recipe and finished the other ½ of the cookie dough. The resulting confection is gooey, chocolaty and delicious. The squares are so rich, you can cut them small, making them perfect for a bake sale or party. 1. Preheat oven to 350 degrees F. Lightly butter a 9x13-inch pan with parchment paper, allowing enough overhang on the long side to lift the bars from the pan. 2. Prepare the gooey chocolate filling: Place the chocolate chips and condensed milk in a small saucepan over the lowest possible heat and cook, stirring constantly, until the chocolate has melted and the mixture has thickened, 3 to 5 minutes. Turn off the heat, add vanilla, and stir until smooth. Set aside to cool to room temperature. 3. Prepare the cookie dough: Place the butter and sugars in a large bowl. Beat with an electric mixer until smooth and creamy. Add the egg, egg yolk and vanilla. Beat well. Whisk together the flour, oats, baking powder, baking soda and salt in a medium bowl. Add to the butter mixture. Beat until everything is well incorporated, scraping down the sides of the bowl as needed. Stir in the chocolate chips. 4. Prepare the bars: Using half of the batch of cookie dough, place dollops into the prepared pan and press down lightly to even it out. Pour the cooled chocolate mixture over the dough and then add small dollops of the remaining dough on top. Don't worry if the dollops don't completely cover the chocolate mixture. Just spread it together as much as you can, and let some chocolate peek through. 5. Bake until lightly browned, 20 to 25 minutes. Set aside to cool completely, then cut into 32 bars. *These are easiest to cut when they have chilled for a while. You'll be able to get nice, clean cuts when they're firmer, then they'll soften up a bit when they're at room temperature again.